I know I’ve already mentioned the this Korma Simmer Sauce, but it’s worthy of another blog post. 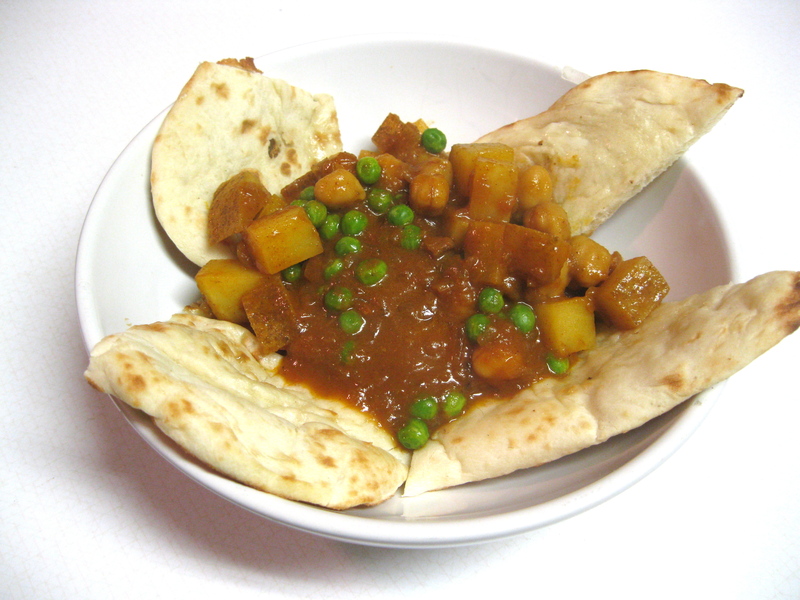 I made some korma tonight with a russet potato, a can of garbanzo beans, and a cup of frozen green peas. Posted in Uncategorized and tagged Indian. Bookmark the permalink. It’s been too long without an update! I haven’t abandoned the blog, but the last week has been a whirlwind. I had my orientation for the nursing program and registered for classes and then went to Chicago for the weekend for a family wedding and some bonding with my friends. I’ll provide a few photos from the weekend in a later post, but first I wanted to mentioned this delicious Korma Simmer Sauce I tried last week. I love Indian, and I’ve been able to make some on occasion, but it often takes quite a bit of time to make it taste as great as it does in a restaurant. Enter the korma sauce. I sauteed some onions and garlic, dumped in some chickpeas, chopped tomatoes and kale, topped with this sauce and a cup of water and simmered 10 minutes. Dinner was ready in 15 minutes and it was amazing! It tastes pretty close to the nav ratan korma we like at our Indian restaurant, so when we were in Chicago and near a Trader Joe’s this weekend, I had to pick up some more. I was surprised how much I liked this because I rarely use any pre-made or packaged foods like this in my cooking. I don’t even buy pasta sauce because I can make my own, but for $2 a jar, this stuff is worth it! The ingredients have no weird additives or preservatives and it made about 3 servings. We also bought the Curry Simmer Sauce to try, so I’ll let you know if it’s as good as the korma. Posted in Uncategorized and tagged Indian, product review. Bookmark the permalink. This week has turned into a busy one. A co-worker of mine had an emergency appendectomy so I have been covering for her at work from 9-5 each day through the end of the week. My meals have been pretty boring, mostly just repeats, like some stuffed shells from the freezer and some channa masala, this time with added spinach and half whole wheat naan. I did try out some new items last night, which were convenient and saved me from pizza or fast food. Brent and I bought some salmon burgers to have on hand and we tried them last night on some whole wheat sandwich thins. I know everyone likes these sandwich thins, but I was pretty underwhelmed. I bought them because I needed something for the burgers and I was (gasp!) out of artisan bread dough. Convenient but bland. The burgers were pretty ok. Again, nothing special but very convenient. I chopped some fresh dill and mixed with mayonnaise to top the burgers with and chopped a salad to go along side. The whole meal took 8 minutes to make and when school and clinicals start up in the fall I’m sure most of my meals will be similar to this. It’s almost the weekend. Brent and I are going to Cedar Point with some friends this weekend and I’m really excited! I haven’t been to an amusement park in a long time, and of course, I always love seeing my friends. Are you doing anything fun for your three day weekend? Posted in Uncategorized and tagged Indian, product review, Salmon. Bookmark the permalink. Brent and I love Indian food, but, much like our love of sushi, it is relegated to the “restaurant only” category because I’ve never really been able to replicate it at home. Although, to be fair, I haven’t tried all that hard because I like our local Indian restaurant quite a bit. I guess I was feeling up for the challenge, so after finding a few highly rated recipes, I made the effort tonight. I made Channa Masala which has been on my list of recipes to try for over a year. I’m so glad I finally got around to it. I was really tasty. The only change I made to the recipe was to eliminate the amchoor powder because I didn’t have any. I made the whole recipe, which makes a ton! To go along side the channa masala, I made some long-grain rice. I am seriously the world’s worst rice cook. It always just turns out fine, but not very great. However, my other side dish was wonderful! I made some super simple, probably not authentic, Naan. I used some non-fat Greek yogurt for this recipe and I also added some garlic powder and a little bit of melted butter. This turned out amazing — actually better than I was expecting. Naan is pretty much my number one love (and downfall!) at the Indian buffet and I was impressed this was a decent approximation of the restaurant variety. Busy weekend coming up. Tomorrow right after work Brent and I are heading to West Lafayette to see his brother graduate from Purdue Friday night, and then Saturday night we have dinner with his family to celebrate. Good thing we have leftover channa masala to eat quickly before we get on the road tomorrow. Posted in Uncategorized and tagged Beans, Bread, Indian. Bookmark the permalink. Tonight’s dinner was another red lentil recipe from Veganomicon, but this one had way better results. I made the Red Lentil-Cauliflower Curry, which Brent really likes. We’ve made this dish a lot, but I feel very conflicted about it. If this meal and I had a relationship on Facebook, it would be listed under “It’s complicated.” I always think it tastes perfectly good when I make it, but I would never really choose to make it, and often I buy the ingredients for it because I know Brent likes it, but never actually end up making it. Weird, I know, but I still feel happy to recommend that everyone else try it, because it is actually quite tasty. And filling! I always halve the recipe, which is then supposed to make 2-3 servings, but I think it makes 3 very generous portions, because I just can’t eat a ton of it. Must be all the fiber. It sits in my stomach like a rock and makes me not even want to think about food for a long time. Alright, off to veg out and maybe watch a movie. Anyone seen Margot at the Wedding? It’s our latest Netflix movie, but Brent seems pretty disinterested at this point. Posted in Uncategorized and tagged Indian, Veganomicon. Bookmark the permalink. Tonight for dinner I made Chickpea & Spinach Curry from Vegan With a Vengeance. I liked it. A lot. It was one of those meals where, at first bite, I thought “This is pretty good,” and then I kept eating and I was like “Yeah, this is very tasty.” I will note however, that Brent thought it was a bit too salty, which is absurd considering the man adds a teaspoon of salt to nearly everything I make. I did not not notice a significant salt excess, but next time I make it (this will be a make again), I will cut the salt down a bit. I couldn’t find the recipe online, but I’m sure someone else has posted it on their blog somewhere. I feel good recommending that you make it. I served with a side of golden couscous. I can’t make rice, so I’m focusing on other grain side dishes for now. I was watching Oprah today (a perk of having a 3 hour workday) and she of course was talking about how mad she was at herself for gaining her weight back, and how embarrassed she was to stand next to Tina Turner, and her basic message was that it is not an issue with her weight, it is an issue with her not loving herself enough to make time for herself to be healthy. I’m not sure that all of it can be explained by not loving oneself, but I do think there is definite truth to the idea of people not putting themselves first. It may seem selfish if you do it from a vanity standpoint, but when you switch it to doing it for your health, I think it makes it seem more essential for a woman to make time for herself. I was talking to my mom about her desire to get healthy this year, and she, like a lot of women, has always looked at it from the view of “I want to lose X number of pounds,” and I’m never sure where the X number comes from. Always seems kind of arbitrary to me. I don’t think that’s a good strategy, because it makes it hard for her and other busy moms to keep their goal a priority. 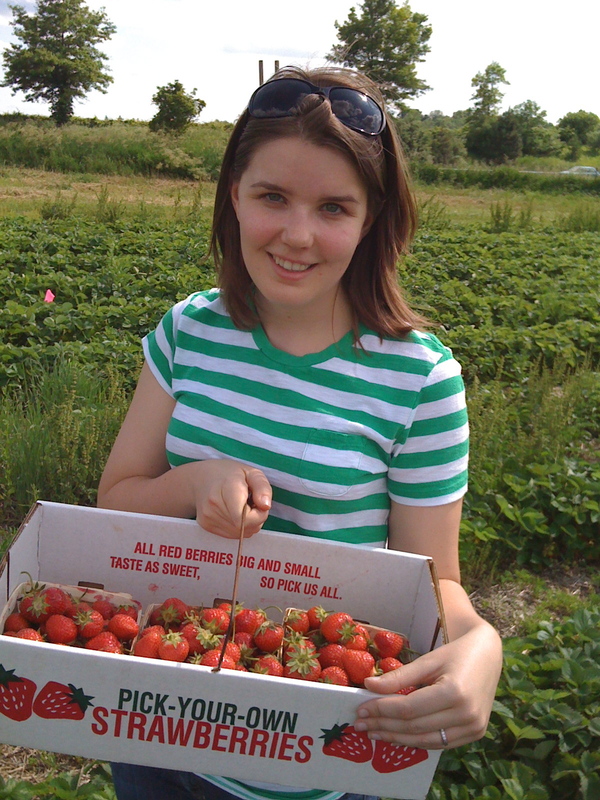 Whereas, this year, she is looking at it from the standpoint of, “I want to lower my cholesterol by X number of points to improve my cardiovascular health,” and I think that puts the focus back on health, and makes it easier to force herself to carve out time for exercise, meal planning or whatever tools she needs. I’ve noticed the same problem in a lot of other women I know, so it was just something that was on my mind this afternoon. Speaking of that, we’re off to the gym now, assuming we can find parking spot. Only three days left! I’m just so looking forward to the holidays this year, way more so in than in years’ past. Unfortunately my celebratory feelings have spread to my diet totally in advance of the actual holiday. Those cookies I wasn’t in love with? Well, I still managed to eat like 3 of them while talking on the phone during in lunch today. Whoops! To rectify the situation, I headed to the gym tonight, and I tried to have a veggie heavy dinner… but then I headed to the store and picked up some wine. Oh well, Thanksgiving’s in 3 days, right? Let the celebration begin! 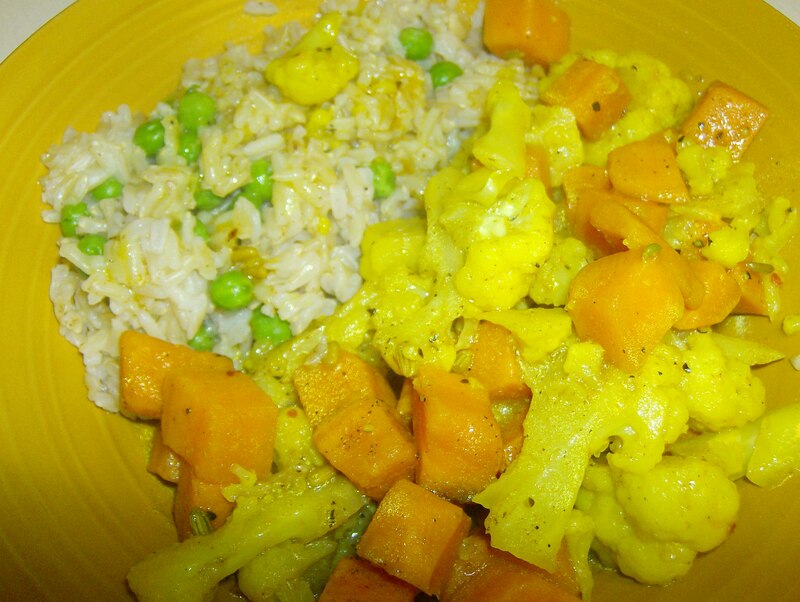 Tonight’s veggie dinner was a variation on Aloo Gobi. I used this as a base recipe, but it was heavily modified. I used sweet potato instead of white because that’s what I had, and like 3/4 of a head of cauliflower. The spices were the same, but I added a lot more water; some mixed with cornstarch to make it more like a gravy. It was served with brown basmati rice, with some peas mixed in. The peas were really just for color, and because I really like them. The dinner was very good. I think it’s a make again. Hopefully it was able to absorb some of the large quantity of sugar I consumed earlier in the day. On a side note, I can’t seem to cook rice. I follow the directions I swear, but usually it’s still slimy or something, like all the water doesn’t get absorbed. I guess I should just use less water or something. It’s always the simple things that elude me.